Steel, Found Objects, Naturally-acquired Rust Patina, Hand brushed Penetrol Oil finish / SOLD - Private Collection / Table Value - $2,700. With its simple, clean lines and elegant design, this contemporary steel end table features a lower shelf made from perforated steel. Glass top rests inside frame. start out by hand-cutting individual pieces from heavy steel plate, tubing, flat bar, wire cloth, wire mesh, or whatever metal stock material I need for fabrication according to the design. Then I grind the rough edges, assemble the pieces together using my tig welder and incorporate other design elements, like found objects or other cut shapes of metal. 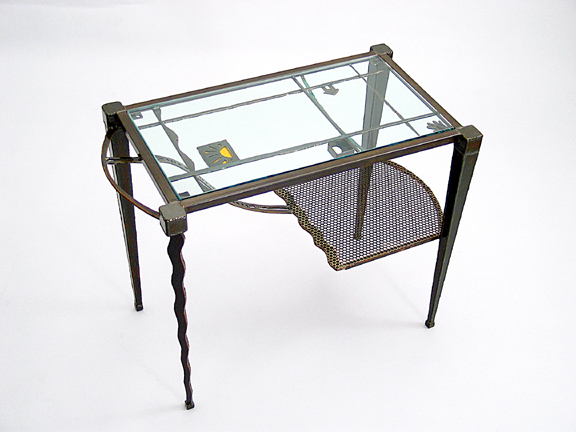 The fabricated table is then cleaned with salt & vinegar to start the metal oxidation process, and then placed outside exposed to the elements to develop its unique, naturally-acquired rust patina. After several days of oxidation, I wash and clean the piece with water, let it dry, and then hand-brush two coats of Penetrol - a metal sealing oil that dries hard to a rich glossy finish. I finish the process by adding any other embellishments, if necessary. Copyright © 2013 Lisa Fedon. All rights reserved.